Troop Messenger is mainly designed to unify the communication channels of small to large businesses from within a secure environment. But don’t take our word for it! Reputed business software review platform FinancesOnline commended the efficiency of our business messenger application in delivering efficient instant messaging for business by honoring us with two awards: Great User Experience and Rising Star awards for 2019. FinancesOnline took a stab at analyzing the nitty-gritty details and elements of Troop Messenger, and discussed why it’s one of the top Slack alternatives of 2019, in the market today. In evaluating our unified business communication platform, the software review experts took into consideration of our affordable Troop Messenger pricing options, product implementation, core functionalities, and much more. 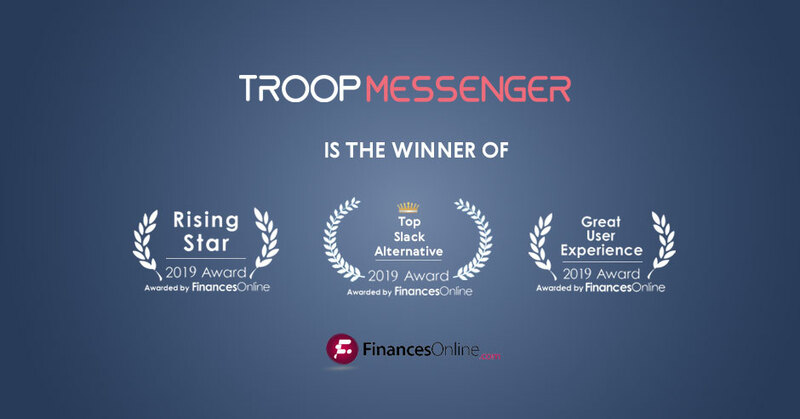 Troop Messenger’s capability to unify all business communication channels within an easily accessible platform is one of the main reasons why we received their Great User Experience award for 2019. Thanks to its accessibility, users no longer need to jump from one software to another to communicate and collaborate. Other aspects commended by the FinancesOnline review team include its secure and exclusive environment for discussing and collaborating on business projects, various types of communication tools to better facilitate discussions, and “Lightning fast” communication, thanks to its mobile support. The FinancesOnline site also utilized its Customer Satisfaction Algorithm to determine the satisfaction rating of our users. We are happy to announce that we received a positive 86% user satisfaction rating. We would love to hear from you as well. A great experience for us to receive these awards from Finances Online. Please share your review and submit here. We thank FinancesOnline for recognizing our hard work at Troop Messenger, and we will continue improving the platform for the benefit of our customers.